There are 4 posts in this thread, and it has been viewed 4829 times. Gururin. What do you think of it? Remember Face Corporation, the developer behind Money Puzzle Exchanger or the original prototype of Treasure of the Carribean? Although former game was basically considered as an addictive puzzle title for the Neo, the latter rather hit the headlines because of the controversial release by NCI in 2012. 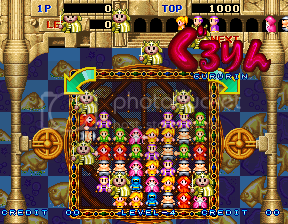 Anyhow, few people know they brought out a third, less popular puzzle title called Gururin in 1994. 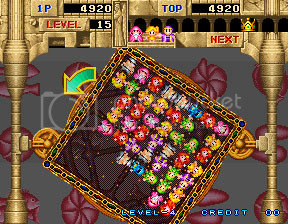 As uninteresting the game may look like at the first glance (at least compared to later standards of Neo Geo puzzle games), the gameplay was quite innovative at that time. The point of interest was that the player could rotate the whole puzzle frame instead of rotating the falling color blocks, um, I mean falling people. Yeah, that's right, the player needs three people of the same color in a row (horizontally or vertically) to break up a column. Now add the possibility of rotating the puzzle frame / screen to let those people fall down to the other side and, provided that you placed the colors correct, you can perform some nice combos. Now you can make somehow a picture of how Gururin works. Or even better, give it a try and demand a High Score Challenge! This is a similar game to the classic Columns on the Sega Mega Drive/Genesis, but with a difference. In Columns you had to arrange different coloured blocks that dropped down so you had three or more of the same colour to make them disappear. 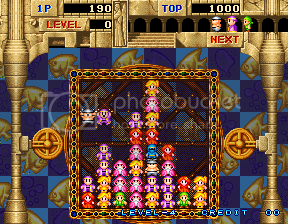 In this game little people fall from the top of the screen wearing different coloured clothes. You must align any three of the same color vertically or horizontally. During the game you do not rotate the three falling people, you rotate the whole puzzle frame itself! Gururin was made and released before the infamous 'Digger Man', but sources say that Digger Man is actually taking place before the Gururin timeline. Anyone interested? If yes, leave a post with a remark or contact Priest to ask for a HSC. I voted that I've never heard of it... but that's not true. It was the closest vote I could make. I've heard about it and seen it, but I've just never felt compelled to play it. 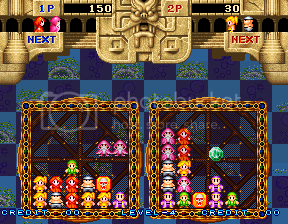 I've only played two good puzzle games on the MVS hardware Puzzle Bobble and Panic Bomber. I don't remember having heard of this game. Looks interesting although seems quite complicated with the rotatating play area - not exactly Tetris in terms of accessability. Still could be good. would like to play it one day. Played this via emulation many years ago, long before I even owned an AES. Really obscure little game but I remember having a lot of fun playing it for a couple of hours. After a while I recall a rising impression that Gururin's gameplay lacked the depth I initially thought it had, simply ramping up the speed and difficulty in finding links until reaching an impossible pace to survive. Unlike better, deeper puzzlers, there didn't seem to be much capacity for adapting or improving strategies to thwart the game's steep difficulty curve. 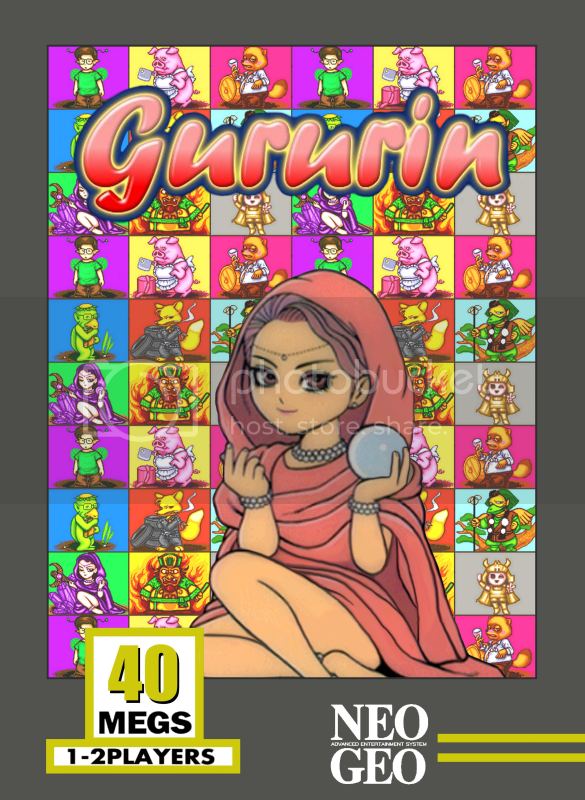 I could be mistaken and selling the game short its due merit as it was some time ago that I played it- perhaps revisiting Gururin would reveal it to be better than the strictly average puzzle game created with arcade coin-guzzling in mind which I recall it seeming to be. Until then, my opinion stands: a good, but not great Neo puzzle title, as best I recollect.